Throwback Thursday- Giftcart.com is celebrating Republic day with a fun contest. Of all the heroes who gave up their lives to make India a free & democratic country, how many faces can you recall? – Like our Facebook page. Entries without liking will be disqualified. – Share the post with friends. 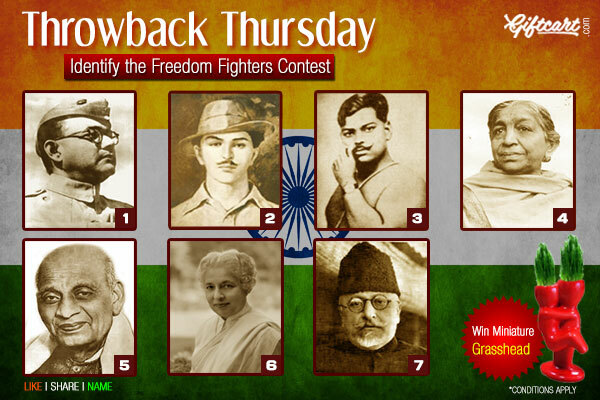 – Name as many freedom fighters as you can and write them in the comment box below. The one with the maximum correct answers stands a chance to win a unique miniature porcelain grass head. The winner of throwback thursday will be announced on January 27, 2014 @ 3:00 pm on our FB page. Hurry! Contest ends January 26, 2014.